These are the kind of markets that test the courage of investors. Currency volatility overlaying equity volatility has exaggerated all price actions. We believe the trillions of dollars of liquidity slowly filtering through the financial system will produce sunshine for these markets. But as we’ve said in our recent presentation, “Enduring a Global Financial Crisis,” we believe this will not be a V-shaped bottom but instead a U-shared bottom. A U-shaped bottom is a stockpicker’s dream. One place to find these stocks is in emerging markets. The dramatic growth in foreign exchange reserves of the BRIC nations makes them attractive. As you can see in the chart below, the $260 billion in combined reserves in those four countries in late 2000 is less than India’s reserves now and is but a small fraction of the nearly $2 trillion held by China. Most of those reserves are held in dollars. And with the dollar’s recent rally, these reserves are worth more than they were just a couple of months ago. The size of reserves and their enhanced value could reinvigorate these key emerging markets and accelerate their economic recovery. Many of these emerging markets companies are trading at two to six times earnings, compared to the S&P 500 average at more than 21 times earnings. This disparity can’t last forever, and as liquidity is pumped into the system, the indiscriminant selling will stop and global stock prices will firm up and begin their return to historic P/E ratios. At home, new research from Credit Suisse points out that the 40 percent market decline this year is the largest market sell-off in the past 60 years. The average is around 15 percent. The key questions are, of course, how much farther down will we go and when will a sustainable recovery begin? Both of these questions are hard to answer under normal conditions, and what we’ve been witnessing has hardly been normal. 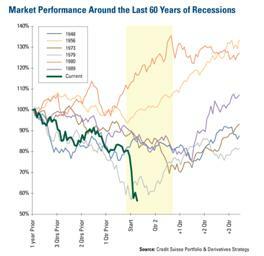 Just look at the chart below that shows market performance during recessions going back to 1948.
Credit Suisse points out that record amounts of institutional cash are waiting for a clearer sign of a bottom. Typically when these investors start believing in markets again, they deploy their cash and give the recovery rally a nice push. The three charts below compare the recent performance of three of our key sectors—energy, materials and industrials—to the performance heading into the recessions of 1989 and 2000. The near-vertical drop at the start of the three quarter of 2008 put all three sectors well below the bottom seen in the 1989 and 2000 recessions. If history is any guide, these sectors have good upside potential as we work our way through and eventually emerge from the current recessionary conditions. Frank Holmes is CEO and chief investment officer at U.S. Global Investors, a Texas-based investment adviser that specializes in natural resources, emerging markets and global infrastructure. The company’s 13 mutual funds include the Global Resources Fund (PSPFX), Gold and Precious Metals Fund (USERX) and Global MegaTrends Fund (MEGAX). For more insights and perspectives from Frank Holmes, visit his investment blog "Frank Talk" at www.usfunds.com/franktalk. All opinions expressed and data provided are subject to change without notice. Some of these opinions may not be appropriate to every investor. Foreign and emerging market investing involves special risks such as currency fluctuation and less public disclosure, as well as economic and political risk. Because the Global Resources Fund concentrates its investments in a specific industry, the fund may be subject to greater risks and fluctuations than a portfolio representing a broader range of industries. Gold funds may be susceptible to adverse economic, political or regulatory developments due to concentrating in a single theme. The price of gold is subject to substantial price fluctuations over short periods of time and may be affected by unpredicted international monetary and political policies. We suggest investing no more than 5% to 10% of your portfolio in gold or gold stocks. The Reuters/Jefferies CRB Index is an unweighted geometric average of commodity price levels relative to the base year average price. The S&P 500 Stock Index is a widely recognized capitalization-weighted index of 500 common stock prices in U.S. companies. The MSCI Asia ex-Japan Index is a free float-adjusted, capitalization-weighted index measuring the performance of all stock markets of China, Hong Kong, Indonesia, Korea, Malaysia, Philippines, Singapore, Taiwan and Thailand, India and Pakistan.